We are so happy to share with you these beautiful Boho stacking bracelets designed and made by the lovely Louisa Borg. We love it when we receive designs from our audience and customers that have been inspired by our in-house designers projects. Learn how to make these stacking bracelets designed and made by Louisa Borg. Inspired by our own stacking bracelets in her personal colour palette. Beautifully presented together using metal beads and charms. Choice of semi-precious beads, either round or faceted or both. Thread the silver metal beads onto the elastic cord with the charm hanging from the centre. Once you reach the end and have enough to fit your wrist, tie a knot and thread through a few of the beads to hide the knot. Simply thread your metal beads and semi-precious beads onto your elastic cord attaching small charms to the elastic periodically until you are happy with your final result. Use 4 mm jump rings to attach the charms on to the charm carrier. Take your chain measuring it to your wrist and cut when you have enough to fit the whole way round. Attach a jump ring to each end of the chain. 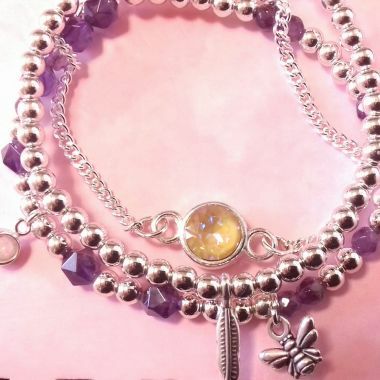 Louisa used a Swarovski Chaton with a connector setting instead of our NEW birthstone connector charms to add more sparkle to her set of bracelets. Close the jump rings around your connector to complete. Ensure you have a clasp on the opposite side of the bracelet so you can fasten this around your wrist.